PrimaveraReader is a user-friendly project viewer that allows users to open and view project data exported from Oracle Primavera P6 in .xer or .xls file format. They can also print and analyze these .xer files with ease. It basically gives users a look into these .xer files and sending progress update, without installing Oracle Primavera P6 on their device, and allows them to determine whether they need to import it or not into their database. With PrimaveraReader, project participants like team members, contractors and subcontractors now have a good view of the project and its details even if they don’t have an Oracle Primavera P6 license. They enjoy total visibility into many aspects of the project including WBS (Work Breakdown Structure), activities, resource assignments, roles, OBS (Organizational Breakdown Structure), and more. PrimaveraReader’s biggest benefit is that it treats you and your team to a complete view of your projects even if you don’t have an Oracle Primavera P6 license, which can be very expensive. Using this viewer application makes all Primavera P6 information easily accessible to you and your group. You don’t have to be fully concerned about receiving a .xer file and having problems opening and gaining access to all project details. Simply put, PrimaveraReader gives you a clear picture of what’s inside your .xer file without you having to shell out money for an Oracle Primavera P6 license. Another clear benefit that you and your team will definitely appreciate is that PrimaveraReader doesn’t present you with any difficult learning curve to get acquainted and maximize the software. It’s very friendly and readily deployable out of the box. On top of that, you don’t have to spend for training costs for using the software. PrimaveraReader lets you preview Durations and Resource Calculations based on your preferred calendar as well. It works wondrously with Windows 10 operating system, making familiarization a whole lot easier for you and your team. Whenever you need professional help with the software, PrimaveraReader provides you with a dedicated Customer Support team to help you with any issue or answer any query that you might have regarding the software. What Problems Will PrimaveraReader Solve? 1. Easy-to-use PrimaveraReader is an affordable viewer solution that provides users with an interactive and dynamic view of the activity details with easy visualization in Gantt chart. 2. PrimaveraReader is standalone plug and play solution that works well with your existing systems and processes without requiring any integration and is not making any changes to the project database. 3. PrimaveraReader allows automatic sending of activity progress update (% complete, Actual Start Date, Actual End Date) that can, later on, be imported in the Oracle Primavera P6 in few clicks with no error. Organizations have different wants and requirements and no software application can be perfect in such a condition. It is useless to try to find an ideal off-the-shelf software product that fulfills all your business needs. The intelligent thing to do would be to customize the solution for your special wants, worker skill levels, budget, and other factors. For these reasons, do not rush and invest in well-publicized popular solutions. Though these may be widely used, they may not be the perfect fit for your unique wants. Do your groundwork, look into each short-listed application in detail, read a few PrimaveraReader reviews, call the seller for clarifications, and finally choose the application that presents what you require. How Much Does PrimaveraReader Cost? We realize that when you make a decision to buy Visual Project Management Software it’s important not only to see how experts evaluate it in their reviews, but also to find out if the real people and companies that buy it are actually satisfied with the product. That’s why we’ve created our behavior-based Customer Satisfaction Algorithm™ that gathers customer reviews, comments and PrimaveraReader reviews across a wide range of social media sites. The data is then presented in an easy to digest form showing how many people had positive and negative experience with PrimaveraReader. With that information at hand you should be equipped to make an informed buying decision that you won’t regret. 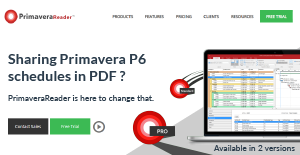 What are PrimaveraReader pricing details? What integrations are available for PrimaveraReader? PrimaveraReader is a complementary product to Oracle Primavera P6. If you need more information about PrimaveraReader or you simply have a question let us know what you need and we’ll forward your request directly to the vendor.